A Lot of time we fell headache due to the receiving any unknown calls on your mobile number or you can also get the information or details of unknown calls with the help of given few apps of a smartphone. At this there are lots of apps available at this time on the internet, but I try to discuss you few important apps which are very helpful to overcome this kind of problem. These apps are running on android and IOS operating systems. This app is properly worked in the India, America and Canada country. You can easily get the detail of any unknown caller like location, telephone operator and which person have the registration of that number. You can easily get the exact location of an unknown caller with the help of Google 3D map facility. This app works without the help of internet and also display the few information like a list of all call detail, status, location, date and time also. You can get the detail during the incoming and outgoing calls. If you want to close the displayed information of any caller, you can press the OFF button without disconnecting the call. Indian users use STD code and International users use ISD code list to get the detail information of unknown calls, but this app in not able to view the number which is already port. Download from Google play store click here. This app claimed that it is world biggest verified mobile database, who work around the world. This app is already downloaded by the ten lakhs users till date. It takes space approx. 5.5 MB on your phone. With the help of this app you can easily get the detailed information on any unknown number of any country of all incoming and outgoing calls. This app also provided the facility to update the call list. This feature has few given features: This app worked via the internet which displays the detail of each unknown number. This app displays the full detail who is calling to you before pick up the phone. You can also block the number with the help of this app in your smartphone. This app also provides the facility to create your own profile, update the photo, contacts on the smartphone. Download from Google play store click here. This app is developed by the line corporation which displays the call detail and also have the facility to block the calls of an unknown caller. This app has the instant caller identification feature which shows the detail of call as you receive the call with a report or tags given by other users. This app the facility not only block unknown call, but also block unknown sms. As per the report of Google play this app saves approx. 600 million members in the database. 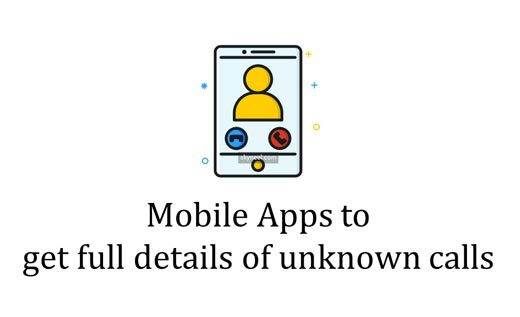 This app has the facility to any user to easily tag the number and give the information of unknown caller detail with the help of offline database. If you have Android 2.2 or above versions, operating system, then you can easily download this app on your smartphone. Download from Google play store click here. This app is very useful to easily block unknown received calls and sms on your smartphone. You have the facility to disable the all received notification from the users. This app work as on the password protection technique. If you want to download this app on your smartphone, then you have Android 2.2 or upper version of your smartphone. This app occupied the space on your smartphone only 190 KB. Download from Google play store click here. I hope you like this details of unknown calls guide from which you will be able to easily get details of unknown calls without any extra efforts. If feel any problem in this guide then please use comment box. Thanks to all.